Whether you wish to brighten the darkened spaces outside your home for security reasons, illuminate the walkways to your house, or simply show-off your beautiful garden, solar powered security and motion lights may be the product for you. They are an eco-friendly way of illuminating the outside areas of your home at night, that is also cheap, easy to install, and versatile (because they are powered by the sun, they don’t need wiring, so you can hang them pretty much anywhere). Picking the right light for you can be tricky though, with loads of different models on the market, and so this review article has been written to help make your decision a bit easier. How do solar security motion lights work though? Essentially, you hang them up around the outside of your house where they absorb sunlight during the day and convert it into energy that can be used to power LED lights at night. As for the motion part, they come with Passive Infra-Red (PIR) sensors which are configured to automatically light up when they detect any infra-red heat motion within their sensor range (and they automatically switch on at dusk and off at dawn). If there is no more movement detected for a certain period of time, they switch off of their own accord. Here are some of the best, sturdiest solar powered security and motion lights available on the market, that we have handpicked just for you. Down below are our individual reviews of the 10 best solar security lights. 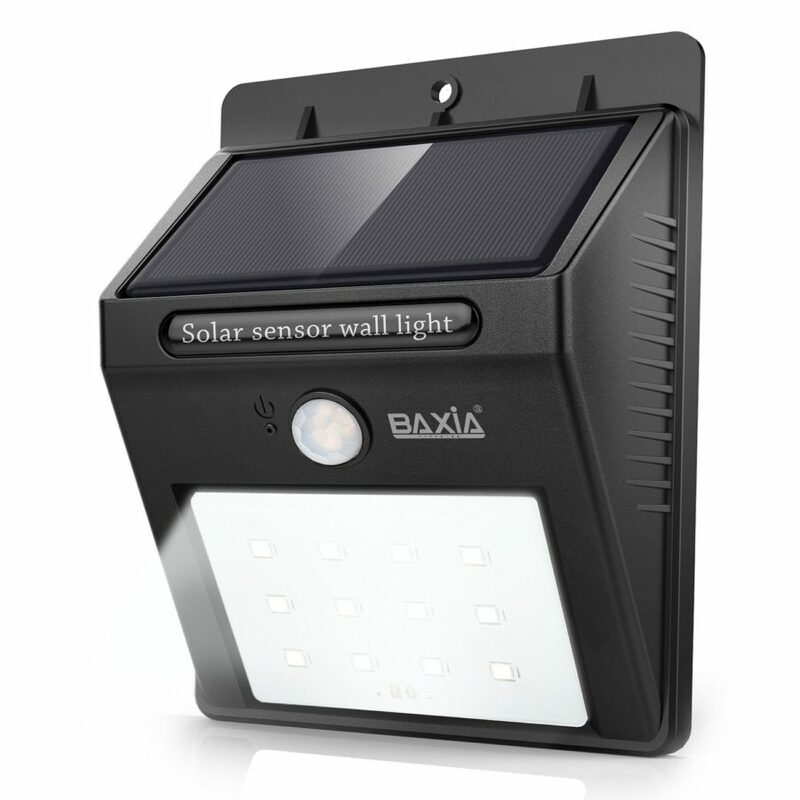 Increase your home security level and comfort with this BAXIA solar motion sensor light. It is useful, waterproof and powerful. Let there be light! Baxia Technology is a boutique manufacturer of household solar-powered devices, and they’ve really outdone themselves with this one. Made up of a dozen powerful LEDs, and supporting a motion angle of 120 degrees, the Baxia Wireless Solar Motion Sensor Night Lights produce up to 400 lumens of ultra-bright light, sufficient to turn a pitch black room into a vibrantly lit space. It’s a perfect choice for dimly lit driveways, yards, gardens and stairwells. Configured to operate only at night, this solar security light is also motion-sensitive, so that it turns on as soon as motion is detected, and turns off after 30 seconds of no further movement. It’s solar powered and eco-friendly: no wires, all you need is exposure to the sun, in fact only 3-5 hours of sunlight are needed to fully charge the battery! What’s more, the battery can store the power for over 12 hours, so that these solar powered security lights operate just as well during winter too. This led solar security light is easy to install, waterproof, and durable because of the solid plastic construction that is capable of withstanding years of usage. It’s an excellent buy, we recommend it. Solar powered: Sunlight is absorbed by the solar panel of these solar powered motion lights and transformed into electricity. No wires, no need to hook it up to the electricity grid. Battery: this solar led security light is charged by exposing during the day. Its heavy-duty, rechargeable 1200mAh Lithium-ion battery can then store the power for over 12 hours working time at night. The light consists of 12 powerful LEDs with a motion angle of 120 degrees which can provide excellent illumination and turn the dark space into a bright lighted space. Bright enough to light up to 10 feet around the lights. No Dim Mode: light only activated after movement is detected in dark. After lighting around 30 seconds, it turns off automatically and leaves total darkness. Simple to use and install. Use the supplied key pin and mounting hardware to switch the solar motion sensor light on and hang it up wherever you fancy. Durable and waterproof: This solar security light is waterproof and durable, its specifically designed to withstand heavy outdoors use. No fear of rain or storm with this solar motion security light! The on/off switch is hidden in a hole designed to be waterproof. Only accessible using the supplied key pin. Waterproof and durable – provides light come rain, hail or sunshine! Easy to install: these solar powered outdoor security lights are extremely easy to mount with hardware and double-sided tape included in the kit. Small and discrete – won’t be a blight on your garden or house exterior. Some reviewers on Amazon claim this solar powered motion sensor light is too bright – blinding, almost – and the device doesn’t come with a blinder or reflector. You have to be very careful where, and how high/low you mount it. Significantly brighter than other similar lights with a higher capacity battery, this solar light from Litom is a great security solution for anybody and everybody. 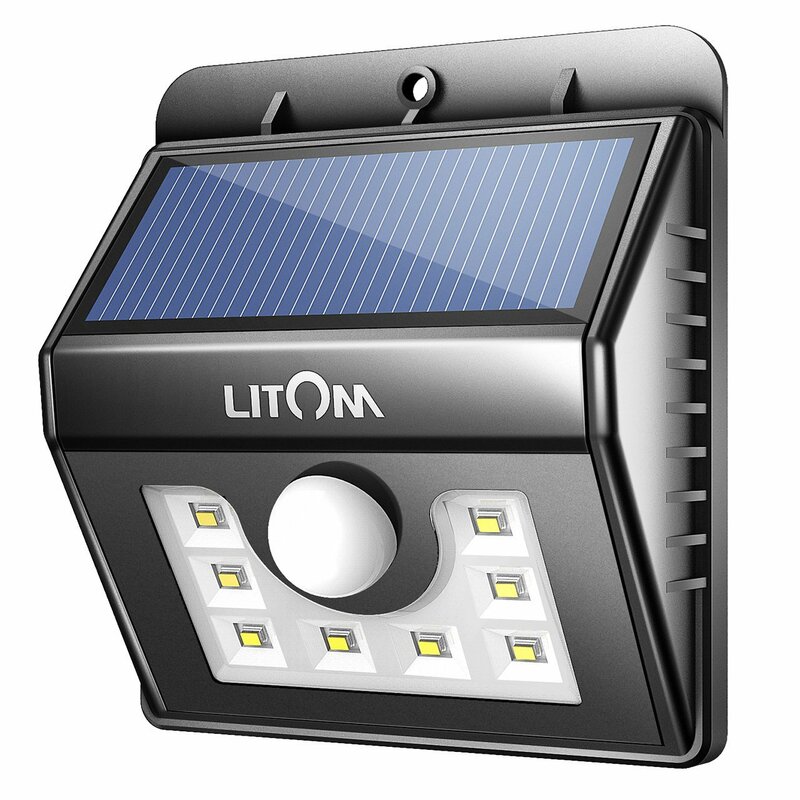 Litom is another popular manufacturer of solar powered security lights. This particular Litom model comes with several distinctive features. Most impressively, it has THREE separate modes, including an “on at dusk, off at dawn” (in which it can put out a steady intensity of light for up to 8 hours at a stretch), motion-sensing mode with dim function (when at rest, it puts out a low beam of about 10 lumens), and motion-sensing mode with no dim function. Adjust the kind of light your property receives at night with just the flick of the switch! When activated, the Litom 8 LED solar motion security light puts out a beam sufficient to see over 30 feet. The PIR motion sensor has a range of about 20 feet and almost 180 degrees laterally. Also, when lit up it stays on for 15 seconds if there is no more motion. Again, this solar led security light is easy to install and basically weatherproof. Litom is a good, reputable brand, and this is another fine product. Efficient, updated Solar Panel: these updated solar powered motion lights rapidly absorbs sun light, generating electricity for eco-friendly lighting. Eight powerful LED Lights: with 8 LED Solar lights, the Litom led solar security light is brighter than many similar lights on the market. Comes with an enlarged Sensor Ball Head, powerful enough to detect movement up to 26 feet away! Weatherproof solar outdoors light: contains two separate layers of tight sealed inner loop which makes it basically weatherproof. Sturdy and weatherproof: the thick plastic and sealing holds up to moisture. Nice and bright: When activated, the motion-sensing mode puts out about 150 to 170 lumens. Litom’s solar motion light is bright enough to illuminate poorly lit areas, but not too bright as to be distracting to the neighbors. Build quality is good and it’s small and discrete at 10 x 11 x 4 inches. The tint is a cool white – neutral to warm – not obnoxiously blue like some LED lights. Some reviewers claim the first mode (on at dusk, off at dawn) is bright enough to illuminate a nearby footpath or building corner only, but not much more. This makes these solar motion detector lights of limited usefulness in that mode. On the ‘Strong Long Light Mode’, the battery lasts 8+ hours, but tends to become very dim in the last 2 hours. Other modes will last all night so long as there is not constant motion. The second and third modes only need a few hours of direct sunlight to provide all-night coverage. No ability to adjust the length of time the solar motion sensor flood light stays on in motion sensor mode, or the intensity of light produced – both measures which would prevent the battery from draining too quickly. This Litom solar lamp offers larger coverage, brighter illumination, and three modes so you can tailor your security lighting to your needs. 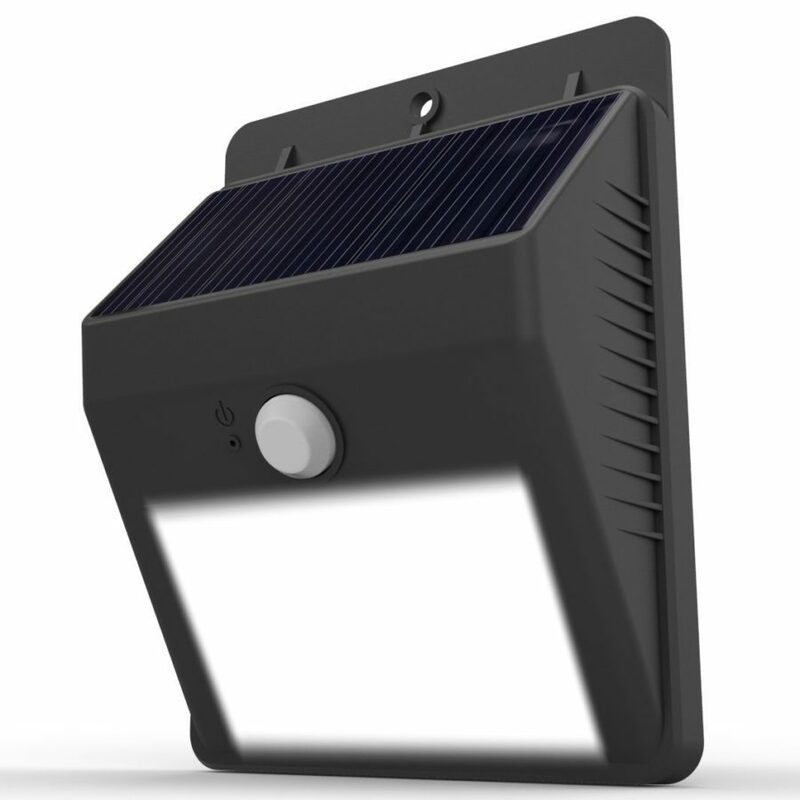 Here’s another outdoor solar security light from the folks at Litom. This one comes with an impressive 24 powerful LED lights (producing up to 526 lumens of light), making it considerably brighter than most other products on the market. Again, this led solar security light comes with 3 modes: a full-on mode for your front or back door, or deck area; a reduced light mode for your balcony and entryway; and a motion-detected mode for your garage, driveway, and fence. The Litom 24 LED solar powered security lights are easy to set up anywhere outside and around your house without too many tools since it is wireless. 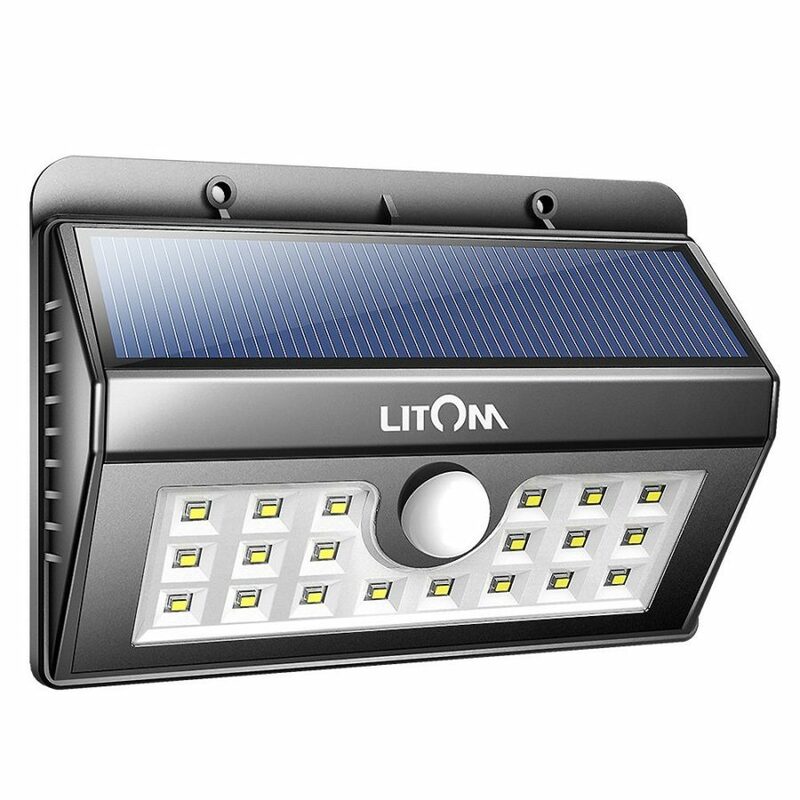 Another thing that will have you rushing out to buy the Litom 24 LED Outdoor solar motion light is that the motion detector is sensitive enough to detect motion up to 26 feet away! Get bang (or brightness!) for your buck with these Litom 24 LED solar security lights. Unique Wide Angle Sensor can detect movements from 10 to 26 feet at up to 120 degrees, providing a much wider illumination area. Features three optional modes for maximum versatility: Full-on Mode, Reduced Light Mode, and Motion Detected Mode. Wireless and easy to install on the walls. Save yourself the trouble of installing annoying electrical wire. As winter approaches the periods of sunshine become sparser, please make sure the Litom motion sensor solar light is placed in areas of direct sunlight all day so that it can absorb more sunlight for charging. Durable, IP65 waterproof, and made of high-impact ABS material. Capable of withstanding rain, hail, snow and sleet. With 24 LEDs and unique wide-angle design, this solar led security light promises to shine brighter and provide a higher level of security compared to other brands of its kind. The 3 LEDs on both sides of the solar lights help illuminate an even wider area. They can reach a maximum lighting angle of 270 degrees. Versatility: this led solar security light allows you to choose from three different sensing modes according to your needs or preferences. There is a full-mode, a dim light sensor mode, and a sensor mode. Easy to install. Simply mount the Litom 24 LED solar motion sensor flood light on the wall using the plug and screws provided. You’ll be finished setting up in no time; no need to worry about wires or cables. For optimal results, make sure you install these Litom solar motion detector lights in a place where there is direct sunshine. Another feature that will make this product capture your heart is the motion sensor which can detect movements up to 26 feet away at a 120-degree angle. It’s almost too sensitive! Lastly, the product is made to withstand extreme weather conditions because it is made of high-impact ABS material. You can expect it to still work well even when it’s raining or snowing. Despite the versatility of the three modes, there is no ability to adjust the length of time the light stays on after detecting motion, or the intensity of light produced. Again, a disadvantage when you want to prevent the battery from draining quickly. Some customers expressed disappointment that it doesn’t charge enough to last for long periods. It is not able to fully charge during the winter season because of the lack of light. Looking for easily installable, energy efficient and powerful security motion-sensor light? Look no further than this URPOWER 8 LED lamp. This stylish solar led security light from the solar manufacturer URPOWER reliably collects energy from the sun all during the day, so that you can illuminate your house at night, and it fits snugly on any outside wall you please. This easy to install motion sensor light features a powerful motion sensor that has a range of 10 feet and 120 degrees. Use it on the garden, backyard, balcony, driveway, or any other location that needs to be illuminated at night. 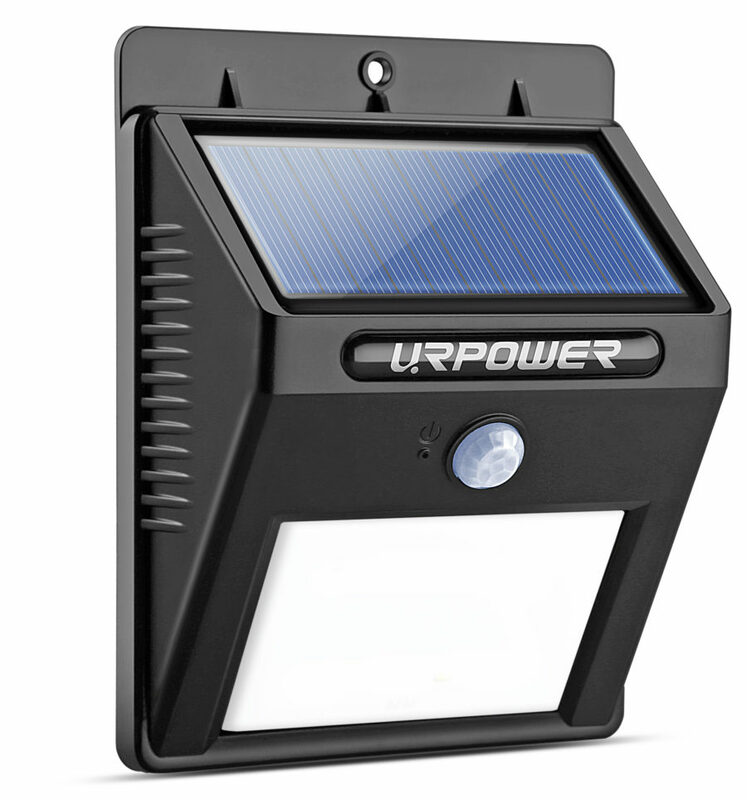 As a weatherproof and heatproof light, URPOWER’s motion sensor solar light holds up under all weather conditions. It also comes with an auto/on/off switch to turn it on and off so that during the day the solar powered security lights will automatically switch off to save energy; at night the motion sensor will dutifully turn on so you can find your way around your property, and ward off intruders. Get extra security and peace of mind with the URPOWER Solar 8 LED Lights today! Fantastic outdoor light for your garden, yard, aisle, porch, patio, or driveway. When motion is detected, the 8 LED beads light provides excellent brightness for your security and safety protection. Supplies up to 12 hours lighting after sunset. There are two modes: bright and off, there is no dim mode. Automated switch: This solar light automatically switches off during the day to save energy and is activated when motion is detected at night. The bright light comes on when motion is sensed and will turn off after 30 seconds of not sensing any movement. You won’t have to worry about the weather with this led solar security light. It has a waterproof rating of IP64 and is heatproof as well. Installs easily in seconds. No wiring necessary, fully solar energy powered. This purchase provides FOUR of these marvelous motion sensor lights. Activated when movement is detected during the night and charging during the day, this Neloodony light will be the perfect outdoor light to help illuminate your way home. ‘Match Your Gorgeous Life’ with Neloodony’s gorgeous outdoor solar security light. This latest version provides you with even more night-time luminosity than the last. It has been upgraded with an increased battery capacity of 1200mAh, modern solar panels for faster battery charging, and 28 bigger LEDs that can provide up to 400 lumens illumination, superior to previous versions with 8 LEDs. These solar powered security lights are also built with an automatic lighting system that auto-ons at night and auto-offs at sunrise, saving you energy and allowing it to shine that much more brightly when motion is detected at night. These Neloodony solar powered motion lights also have an innovative sensor ball head, that provides a longer sensor length of 26 feet. Please note: when using for the first time, punch the on/off switch using the pin then charge the motion sensor solar light in direct sunlight (6-8 hours). 28 LED lights, provide excellent illumination of up to 400 lumens. LED lifespan up to 50,000 hours. With the improved solar panel, the conversion rate of sunlight is up to 17%. Strong battery capacity up to 1200mAh. Can store the power for over 12 hours working time at night. Powerful sensor ball head, giving you a longer sensor length of 26 feet with a 120 degree sensing angle. This led solar security light only has on/off, no dim mode. Is only activated when movement is detected in dark when it turns automatically on. It lights up for 10 to15 seconds, before automatically turning off. Easy Installation & Eco Friendly – outdoor solar powered motion sensor light, no electricity needed. Mount it on the fence or wall with screws (included in the kit! ), no wiring required. Automatic Lighting – auto on at dusk, and auto off at sunrise. No electricity required. No wiring. Lacks versatility: no dim mode, only on and off functions. Also, you can’t adjust the intensity of the light, the sensor range, or the time it lights up for, in order to conserve battery power. This Litom 20 LED lamp offers ultra bright lighting and strong illumination for a large area to help you keep yourself and your property safe from intruders. And another lovely Litom outdoor solar light! The Litom LED is just the light for those of you who need to illuminate a larger area of a nighttime. 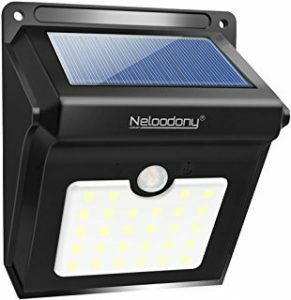 In fact, with 20 LEDs and a dazzling 440 lumens output it’ll effortlessly brighten up a good sized backyard, far outstripping the other solar lights in this price range. The enhanced motion sensor of the Litom solar motion light is also bigger and better, easily detecting motion from a much longer distance of 20 feet. This solar security light has 3 modes including full on mode, reduced light, and “off until motion is detected” mode. There are 2 holes in it so it can either be hung, or mounted with the two included head screws plus wall plugs. 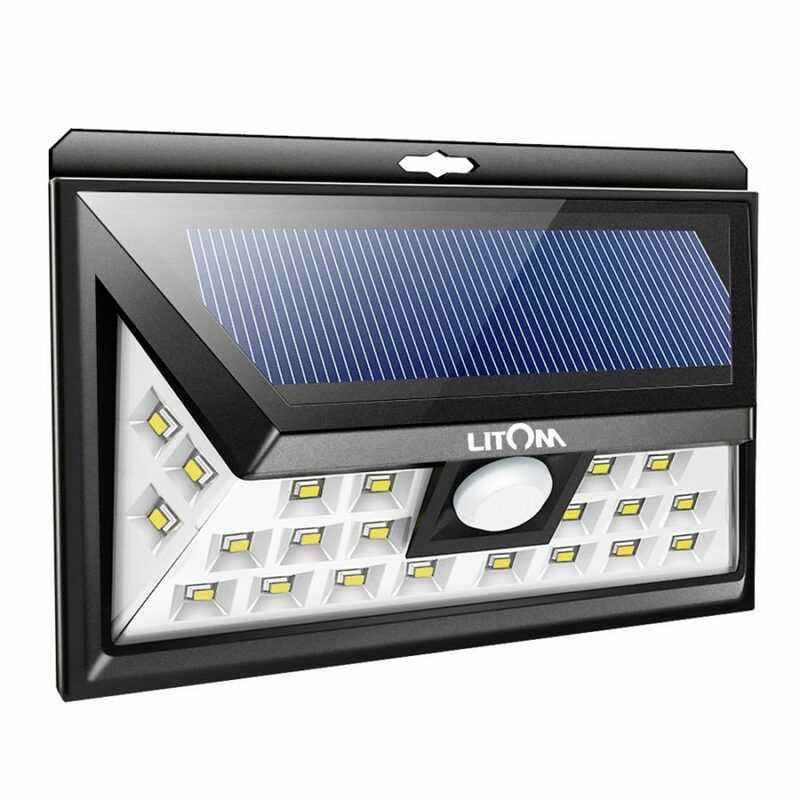 Finally, the Litom solar led security light is strongly built with thick plastic and tightly-wrapped sealing that holds up to moisture, can easily withstand rain, hail and snow without batting an eyelid. Whether you want to light up your property to deter intruders, or illuminate the front of your house for your own safety when returning during night hours, go out and get the Litom 20 LED led solar security light, and ensure your family’s safety today. 20 LED light beads providing up to 440 lumens. Solar powered: the Litom 20 LED solar powered motion lights are eco-friendly and wire-free, making them convenient to install and move anywhere around your outdoor garden. It can stay lit for eight to ten hours, with just a full day charge. Imagine the money that can be saved in energy bills. And you can reduce your carbon footprint too. 20 LED lighting system provides ultra bright lighting over a wide area. Greater illumination than many other solar powered security lights on the market. The powerful motion sensor senses movement up to 26 feet away. Nothing will get past these solar motion detector lights – even stray animals can activate the sensor. It has a 180 degree wide sensor angle, larger than many other similar products on the market. This solar motion sensor flood light gives your family additional peace of mind. By absorbing sunlight for just a handful of hours during the daytime, these solar motion flood lights can keep your place lit up all through the night. The light endures for 8-10 hours if the battery is fully charged. As winter approaches, make sure the light is in direct sunlight all through the day so that it will be fully charged come nightfall. Three modes: Full on Mode; Reduced Light Mode; Motion Detector Only Mode – three modes suitable for different purpose. You can choose the “Full Mode” that is suitable for outdoor patio, front and back door, deck area backyard; “Reduced Light Mode” that you can use for side and back yard, entryways; and the third “Motion Detector Mode” which is a perfect setting for garage, driveways and the like. Almost too sensitive, according to some customers: because of the wide sensing range, these solar powered motion sensor flood lights may pick up passing traffic, which means they’ll be turning on and off all night! Those two modes may not work well in winter, or climates with high cloud cover. With features like PIR motion sensor, peel and stick application and fast solar charging, the Costech solar light is one of the best solar security light options out there. Other features: weatherproof, heat resistant. This Costech solar-powered motion activated light is a good, solid solar LED security light, capable of providing your property with consistent and long-lasting security. With an efficient solar panel, long lifespan lithium-ion battery, long-range PIR sensor, automated switch (on at dusk, off at dawn), and easy installation, it contains most of the features you look for in outdoor solar powered security lights. Basically, it’s a good reliable product; hang it in driveways, garages, backyards, porches, and parking, and let it serve your family today! Solar panel which converts up to 17% the sunlight it receives into useful energy. It’s both convenient and eco-friendly. It can shine for 12 hours with just 7 hours charging from the sun. 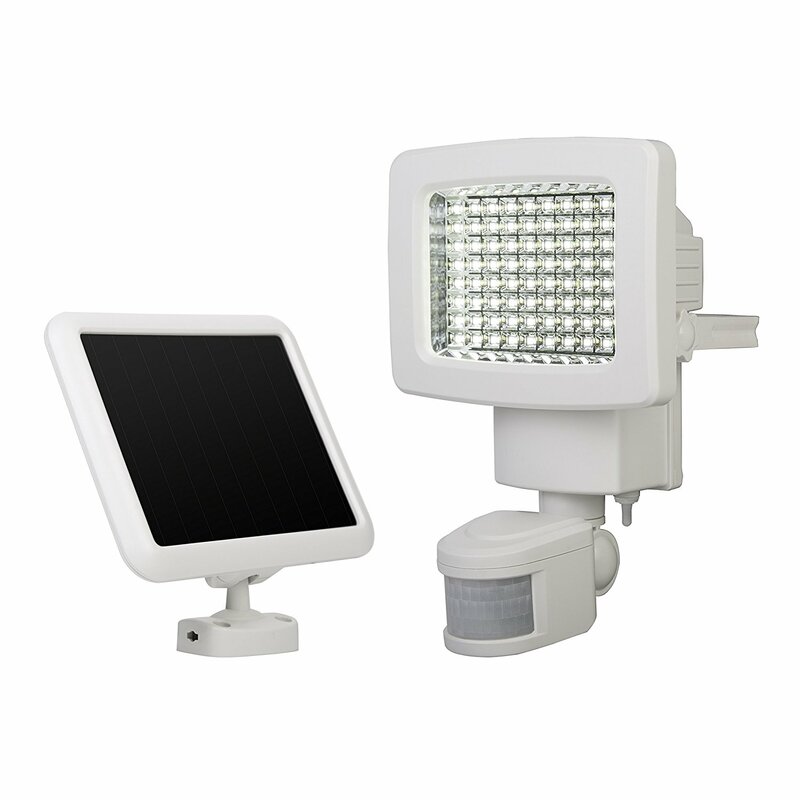 The Costech solar led security light contains a built-in, super-efficient Lithium-ion battery. The battery can be recharged again and again and has a multi-year lifespan. Extra Bright: powerful LEDs provide illumination of 180 lumens. Gives you extra security and peace of mind. PIR motion sensor activates this light whenever there is movement. Its range is 10 feet, 120 degrees. If no further motion is detected and the light turns off automatically after 30 seconds. Automatic OFF/ON function. The solar motion sensor light automatically senses when it is becoming too light. Once ambient light levels reach a particular threshold, the light goes into standby mode and beings charging. At nightfall, it powers up again. No need for complicated electrical wiring or installation. These solar motion detector lights can be installed in a jiffy; just peel back and stick to whatever surface – bricks, metal, glass, wood, etc. Screws and hinge included and no complicated wiring is necessary. Durable, weatherproof and heat-resistant plastic construction. Multi-year lifespan. Only lights up for 30 seconds after detecting motion, and you’re not able to adjust the time. Installed in seconds, durable and eco-friendly are only some of the features that make this Lemontec light such a great solar LED security light option. Movement detected by: PIR motion sensor. If want to lower your carbon footprint by getting some solar powered security lights, but don’t know which to buy, consider purchasing the Lemontec Waterproof Wireless Solar Spotlight. This product is just about the best outdoor solar motion light out there on the market today. Simply expose it to sunlight during the day and it will charge by itself, providing your porch, garage or garden with up to 12 hours of illumination during the night-time – and with no power bills! It is wireless and has a motion sensor so you can put it anywhere outside the house and let it do its job. The Lemontec solar motion detector lights turn on automatically during the night and turn themselves off at sunrise. Sturdy, weather-resistant, and with a sleek, innovative design that belies its price, the Lemontec Waterproof Wireless Solar Spotlight is more than just your run-of-the-mill solar light. It’s a great solar powered outdoor security lights option for those of you on a budget. Solar-powered outdoor lights. Great for your garden, yard, or sidewalk. No wires, no carbon emissions, no power bills. PIR motion sensor is triggered when movement is sensed within 3 meters or 15 feet. If no further movement is detected during the 10 seconds that the solar powered motion detector lights are on, they turn off automatically. Weather-resistant, waterproof, and heatproof for durability. Easy to use, an install. One thing you will LOVE about these solar motion flood lights is that they can be stuck to almost all kinds of walls. Whether you have brick, wood, metal, or glass walls, you can be sure that the lights will stick securely. If you have doubts, you can opt to use screws and a hinge to mount them instead. No need to deal with pesky wires. According to a few buyers, not all the lights worked properly after a while. 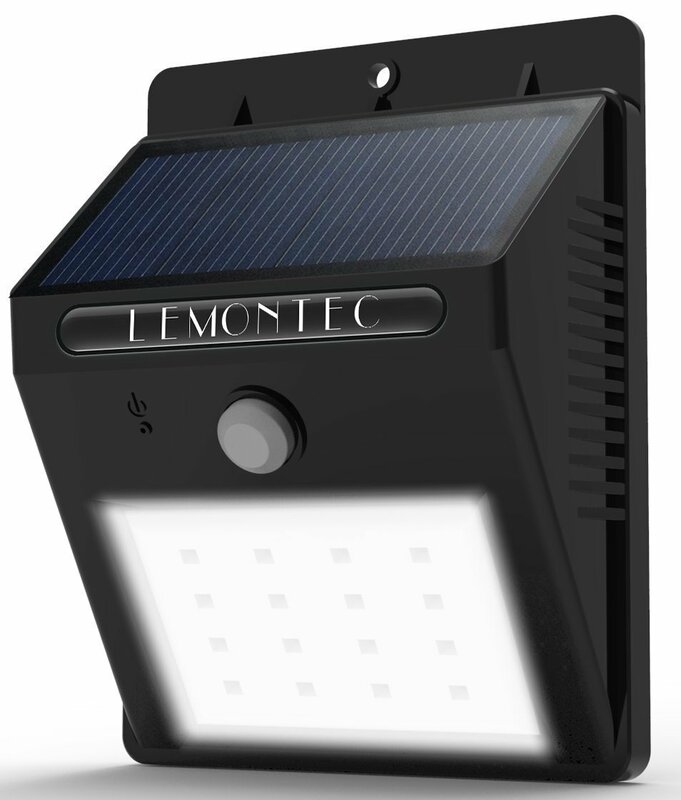 Others complained that the Lemontec solar motion sensor light needed to be charged for too long. With only 80 lumens output, this solar security light is not as bright as some of the other products reviewed here – although that may also be considered an advantage, if you don’t want a piercing, blinding light that could arouse the ire neighbors! Featuring an amorphous solar panel this Sunforce solar motion light will charge even on cloudy days to provide you with light during the night. Sunforce is a bit of a newcomer to the solar outdoor light market. But despite this, the Sunforce 82080 80-LED Solar Motion Light is already mingling with the elite. On the surface, it’s a relatively simple kit: Buyers receive the solar panel, 15ft of wire, an 80 LED motion LED light, a mounting system and some rechargeable batteries. Special characteristics of this product include the solar panel which is actually an amorphous solar panel, in which silicon is sprayed onto glass in thin layers. This allows the solar motion sensor light to generate electricity in all weather conditions, like cloudy environments that don’t receive much sunlight. The amorphous solar panel charges 3 AA batteries, guaranteeing light when and where you need it. Sunforce’s solar led security light also comes equipped with 80 extra bright white LEDs housed in ABS plastic, providing a whopping 900 lumens of light. Capable of automatically detecting motion up to 30 feet away this solar security light is designed to stand the test of time due to its sturdy metal housing. Three settings on the back of the unit controlled by easy to use dials adjust when the light turns on, how long it provides light for, and the sensor range. In summary, the Sunforce 80-LED solar motion light is truly one of the most versatile and powerful outdoor solar powered security lights on the market today. These solar motion detector lights provide lighting to garages, sheds, pathways, giving you extra security and peace of mind! Adjustable settings with easy to use dials: (1) The lux setting determines the level of darkness needed for the light to turn on. Set the light to go on at dusk or wait until total darkness just by flipping a dial. (2) The time setting determines the length of illumination once the light is tripped on. (3) The Sens dial allows you to set the range of movement detection. Turn it up for detecting motion up to 30 feet or down if you don’t want it lighting up every time a car passes. Highly sensitive: detection range of 180 degrees and distance of 30 feet. Some customers report finding it difficult to install this solar motion sensor light: comes with vague instructions; also the light can only be adjusted vertically on the mount, there is no form of horizontal tilting to angle the light towards specific areas. This means that there may be some limitations over where it can be installed. Mount this Sunforce weather resistant solar motion security light anywhere you need and enjoy its super-bright white light illumination. Using the power of the sun to illuminate areas cloaked by darkness, and giving additional security to your property, the Sunforce 60 LED Solar Motion Security Light is another gem released by Sunforce. 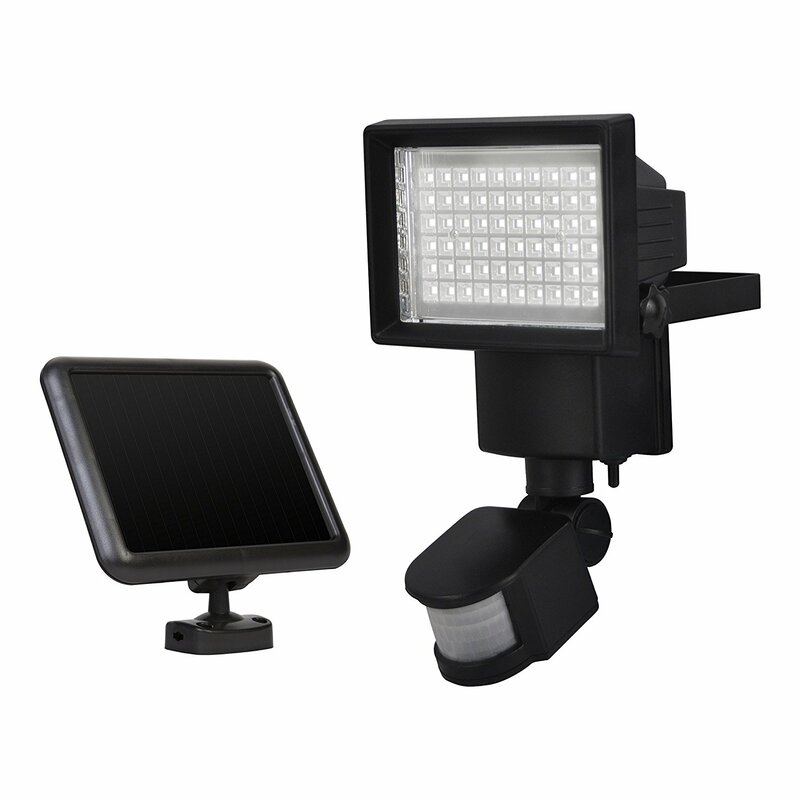 This solar motion security light can be used on your pathways, garage, shed or remote cottage. Charged by the sun during the day, the LED lights deliver up to 8 hours of illumination on a single charge. Upon the arrival of dusk, the solar powered motion sensor light turns on automatically where there is movement, using 60 extra-bright white LEDs held in ABS plastic for added strength and durability. Comes with three adjustable settings that allow you to dim or turn off the lights and re-charge depleted batteries. Sunforce’s solar motion light is also capable of being run continuously for a limited time (around 45 minutes). These solar powered security lights are very easy to set up, and the body is strong and sturdy. In fact, the latter is made up of metal instead of plastic which makes it more durable than many other models. Customizable settings: This light comes with 3 adjustable settings that allow you to control the level of darkness that must be reached for the solar motion flood lights to turn on; the time the light is on when motion is detected (either 30, 60, 120 seconds); and the range of the sensor. Fully weather resistant and can be mounted almost anywhere; no wiring required. Durability: encased in metal instead of plastic. Several customers complain that this outdoor solar motion sensor light is not really weather resistant: even if you install the lamp in a dry area, water still gets inside. You need to purchase extra materials to really protect the device. Positioning of the light: the Sunforce solar powered motion detector lights can be adjusted to up/down only so getting the light to face where you want may involve buying additional hardware to get the best results. To help you find the best solar motion and security lights for your property, we have put together reviews of some of the best models on the market today. Each one of them has its own unique features, whether it’s the brightness, sensitivity, battery, or the variety of modes and settings they come with. Remember, also, that if you’re using an outdoor sensor, you want something that will hold up in all kinds of weather. Hopefully at least one of these lights provides the requirements you are looking for, and this article makes your purchasing decision easier. Get that extra peace of mind and security you’ve been looking for, and reduce your carbon footprint at the same time, with an outdoor solar lighting system! Previous story What Is Solar Power and How Does It Work?